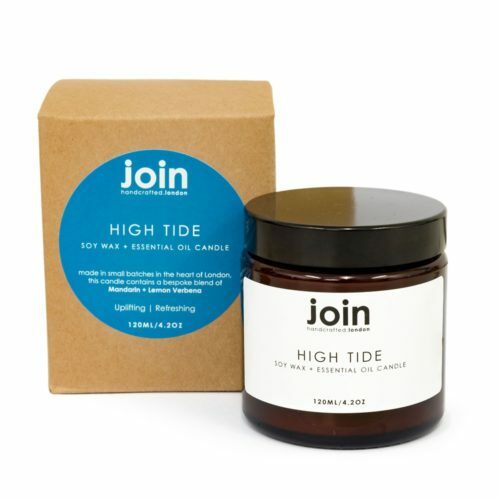 The High Tide luxury candle is a refreshing soy wax candle with natural mandarin and lemon verbena essential oils to blow the wind back into your sails. Available in 3 sizes. The Kernel soy candle is a masculine blend of cedarwood and black pepper essential oils. A great choice for a mens gift. Choose from 3 sizes. Lavender candle handmade in London from 100% vegan soy wax and high quality pure essential oil. Lavender is a traditional aromatherapy treatment for anxiety, stress and sleep. Its warm glow creates a soothing aroma. The glass jar candle is packaged in 100% recycled materials. The Low Tide luxury scented candles contain a soothing mix of chamomile and patchouli to transport you on a mental getaway. Made from vegan soy wax and essential oils. Available in 3 sizes.